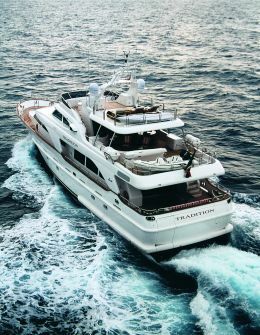 The Azimut Group was one of the first to believe in the possibility of building superyachts in composite, a clearly winning choice that led it, in very few years, to a position of world leader in this yachting sector. The main advantage in creating boats of this type is linked to the possibility of building hulls in series, an actual range with an obvious reduction in production time and amortisation of design costs "spread" over all the examples produced. A relatively young and innovative building technique which however retains standards of quality and reliability in line with the prestige of this historic Italian boatyard, factors that are in any case necessary in order to emerge in a sector as competitive as that of superyachts. For the Benetti boatyard today, composite means a range of vessels consisting of three models, all with semi- displacement hulls: the 45 metre Vision, the 35 metre Classic and the Tradition, the smallest at "only" thirty metres. It is the Tradition that we present here, designed by Stefano Righini, an extrememly prolific architect with close links to the Group for which he has already designed several motoryachts, especially with flying bridge but more recently also open, that have very often met with critical and public acclaim. Externally the boat has fairly classic forms, elegant and characterised by great glazed areas which, as well as giving thrust to the whole, ensure that the indoor spaces are excellently lit. Much emphasis has been placed on exploiting all the open air space, a set-up which finds full expression in the three on-board areas, all distinguished by full privacy, which owner and guests can use as dining, living or relaxation spaces. The section aft features a hangar whose full exploitation is ensured by a large door which, once open, turns into a bathing platform. The garage is fairly spacious and comfortably accommodates either a large tender or a slightly smaller boat plus jet-ski. Fill load displacement: 143.000 Kg. For further information: Benetti; Via Coppino, 104; 55049 Viareggio (LU); tel. 0584 3821; fax 0584 396 232; e-mail: info@benettiyachts.it; web site www.benettiyachts.it. Let's now analyse the interior, starting from the lowest deck, the aft part of which is wholly given over to the guests' night area. 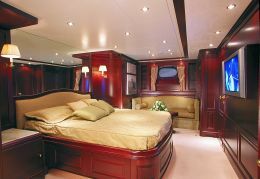 There are two twin-bed cabins, both decorated with mahogany and with red and green upholstery respectively. The third cabin - a VIP one - is in an intermediate position between the great engine room and the aft garage. Over and above its spaciousness - it takes up the whole beam - and its furnishings based on cream-coloured upholstery, it is characterised by private access directly from the saloon, which guarantees maximum privacy. There is a large private bathroom, a comfortable dressing room and a small living room with a desk so it may be used as an office. 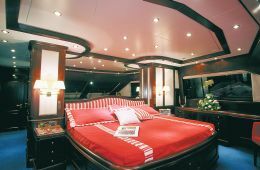 Forward, quite separate from the other environments, are the crew's quarters with no less than three cabins sleeping a total of five, with bathrooms, showers and a fair sized dinette. From here there is direct access to the kitchen which is located forward on the port side of the main deck and is equipped with quality accessories - Gaggenau and Miele - which is to say ready to meet the needs of a demanding chef. To starboard there's a lobby with companionways leading to the decks above and below, but there is also access to the owner's quarters. The owner's suite has a panoramic view that can be perfectly enjoyed thanks to the extensive window area. There is a large bathroom with a hydro-massage tub in the corner, and a comfortable dressing room. 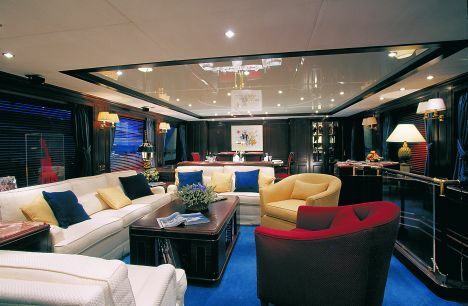 The decoration is exquisite: as elsewhere on the yacht, special care has been taken with the chromatic aspect involving the matching of decisive colours, chiefly blue, with other lighter ones in a context of unequivocally classic "flavour", highlighted by the use of woods like teak and mahogany which are a consolidated part of the seagoing tradition and stand outside time and fashion. 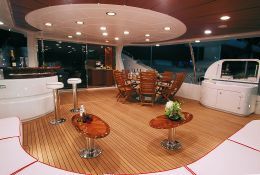 It should be pointed out that the interiors are the work of another designer who is an "aficionado" of the Group, Francois Zuretti, who gave excellent demonstrations of his abilities working on Avigliana superyachts. The décor of the various environments includes materials such as Carrara marble and granite and exclusive fabrics from Rubelli, Dedar and Sahco Hess Lein etc..
Much emphasis has been placed on the saloon: as well as being spacious it is truly elegant, perfectly dimensioned for sofas and armchairs but also refined "boiserie" in mahogany. The Tradition's dining room has an oval table comfortably seating 8, as well as an actual "cellar" containing up to 70 bottles, a fact that will be appreciated by wine connoisseurs. From the "lobby" mentioned earlier you reach the upper deck and the indoor bridge, the latter also upholstered in blue, the large corner sofa fabric also being used for the ceiling covering. The flooring is in slat laid teak. On a slightly different level with regard to the cockpit there is a service area with dumbwaiter, fridge and an always useful sink. From here you can go directly outdoors to an area equipped mainly for meals, with a round table seating eight, a barbecue and a corner bar. But it is also a living area with a large sofa and a low coffee table. Forward, Righini has created a second outdoor area, perfectly accessible by two companionways at the sides of the service area. 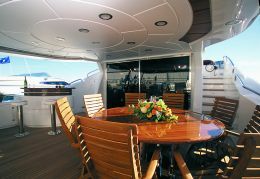 The outdoor bridge is in the middle of this sundeck. The excellent view can also be enjoyed by guests, seated on the large sofa provided. Again on a different level the designer has created the actual sunbathing area, suitably equipped with sun-beds.